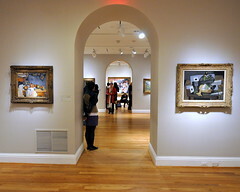 DC Fire & EMS is reporting that there was a fire at the Phillips Collection at 21st & Q in Dupont Circle this morning, confined to the roof and upper level of the gallery. The sprinkler system was activated and that kept the fire in check. It’s not known yet the extent of the damage at the Phillips, or whether any art was damaged or destroyed in the fire, or by the fighting of the fire. Probably best to call before going over if you had plans to check out any of their exhibits today or tomorrow.